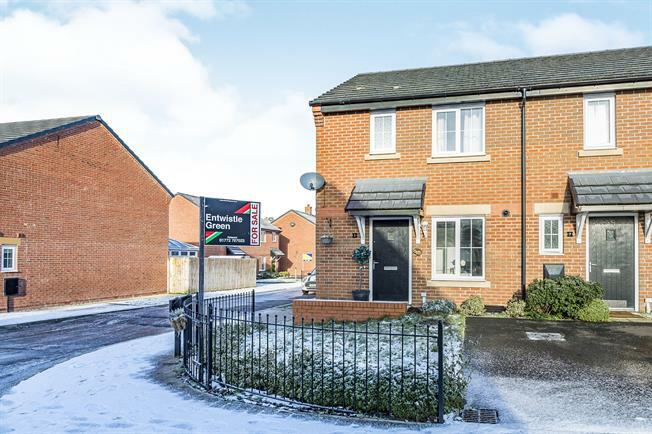 3 Bedroom End of Terrace House For Sale in Preston for Asking Price £170,000. This fantastic three bedroom home offers stylish open plan living, perfect for first time buyers. The dining and living room opens out onto your garden and is the perfect space for entertaining family and friends. The beautiful contemporary kitchen provides a host of integrated appliances and to complete the layout of the ground floor the property benefits from the final added touches of convenience including a WC and storage cupboard. Upstairs, there are three bedrooms, two of which are doubles and a family bathroom. Externally, there is a driveway with parking for three cars and a extensive landscaped rear garden with a raised patio area. All this is complemented with a remaining 7 years+ NHBC warranty. View to appreciate. Double glazed uPVC window facing the front. Radiator, vinyl flooring, tiled splashbacks. Low level WC, pedestal sink. UPVC French double glazed door, opening onto the garden. Double glazed uPVC windows facing the rear. Radiator, carpeted flooring, under stair storage. Double glazed uPVC window facing the front. Radiator, laminate flooring. Roll top work surface, fitted wall and base units, stainless steel one and a half bowl sink with drainer, integrated oven, gas hob, stainless steel extractor, integrated dishwasher, space for washing machine, integrated fridge/freezer. Double glazed uPVC window facing the front. Radiator, vinyl flooring, part tiled walls. Low level WC, panelled bath, shower over bath, pedestal sink.